...Only God's Truth Can Set You Free!! About, Those Who Are Wise Will Shine! Home » Christian Persecution , Courage , Deeper Life , ISIS , Only Jesus , Rapture of the Church , Salvation , Second Coming , Standing Up for Jesus , Watcher » Obedience, Revival and the "Watchers Trinity"
Obedience, Revival and the "Watchers Trinity"
A clear directive from Jesus concerning the final days was that Christians are to pray and Do God's Business [occupy - KJV] till He returns. Despite conditions on earth we are to continue plowing straight ahead with the gospel declaration scattering salt, light, and the fragrance of Christ wherever we go. This has prompted many to believe there could even be a great outpouring of the Spirit—a sort of "Great Awakening"—before Jesus returns. But does the Bible really teach that? Good question. Let's look first at what is said about those days. "But know this, that in the last days perilous times will come: For men will be lovers of themselves, lovers of money, boasters, proud, blasphemers, disobedient to parents, unthankful, unholy, unloving, unforgiving, slanderers, without self-control, brutal, despisers of good, traitors, headstrong, haughty, lovers of pleasure rather than lovers of God, having a form of godliness but denying its power. And from such people turn away!" (2 Timothy 3:1-5). "Now the Spirit expressly says that in latter times some will depart from the faith, giving heed to deceiving spirits and doctrines of demons, speaking lies in hypocrisy, having their own conscience seared with a hot iron [desensitized], forbidding to marry, and commanding to abstain from foods which God created to be received with thanksgiving by those who believe and know the truth" (1 Timothy 4:1-3). These passages reveal at a minimum two things: First they reveal the horrific conditions on earth in the "latter times." The picture the Holy Spirit paints through Paul's brush is a sign of the times that tell us to be "hand-to-the-plow" ready for Jesus could return at any moment. Secondly they teach, before Jesus returns conditions in the world will reflect that humanity has forgotten God and is in dire need to return to Him. These godless conditions are represented by sins against self, sins against family, sins against humanity, and sins against God. They permeate every area of life including the church. They are dire signs and today we see them all around us. But let's never forget that God does not relish in judging the wicked, nor their death, (Ezek. 18:32, 33:11). He desire’s that men respond to His prompting and repent of their godless ways. "I know your works, that you are neither cold nor hot. I could wish you were cold or hot. So then, because you are lukewarm, and neither cold nor hot, I will vomit you out of My mouth. Because you say, 'I am rich, have become wealthy, and have need of nothing'—and do not know that you are wretched, miserable, poor, blind, and naked—" (Revelation 3:15-17). "I counsel you to buy from Me gold refined in the fire, that you may be rich; and white garments, that you may be clothed, that the shame of your nakedness may not be revealed; and anoint your eyes with eye salve, that you may see. As many as I love, I rebuke and chasten. Therefore be zealous and repent. Behold, I stand at the door and knock. If anyone hears My voice and opens the door, I will come in to him and dine with him, and he with Me" (Revelation 3:18-20). What Jesus does is leave the door open for repentance. He asks this last days church to buy from Him "gold refined in the fire." In other words to examine our hearts, motives, actions, and lifestyles against the grid of that which will judge us, God's Word (John 12:48), repenting of all those things that do not bring glory to His name—that do not reflect the loving and sacrificial nature of Christ. That can can only happen through genuine revival in our hearts. Sadly, and because of conditions foretold in the Bible, I do not believe there will be world-wide revival or even a "Great Awakening" of sorts before the rapture of the church. But I do believe there can and will be pockets of revival in many places across the land. Christ is calling His church to come to Him with repentant hearts—fully destroying our idols—that we may serve Him obediently and thereby open the floodgates to a time of refreshing in our lives, (cp. Acts 3:19). Trust me, believers will need this special empowerment to face the current and coming ridicule and persecution that is facing her. The church today is in dire need of genuine Christian witnesses--those who are willing to pay whatever Jesus asks of us--even if it be similar to the high price the 21 Christians beheaded by ISIS suffered recently. Suffering for Jesus' sake always results in good for the lost. 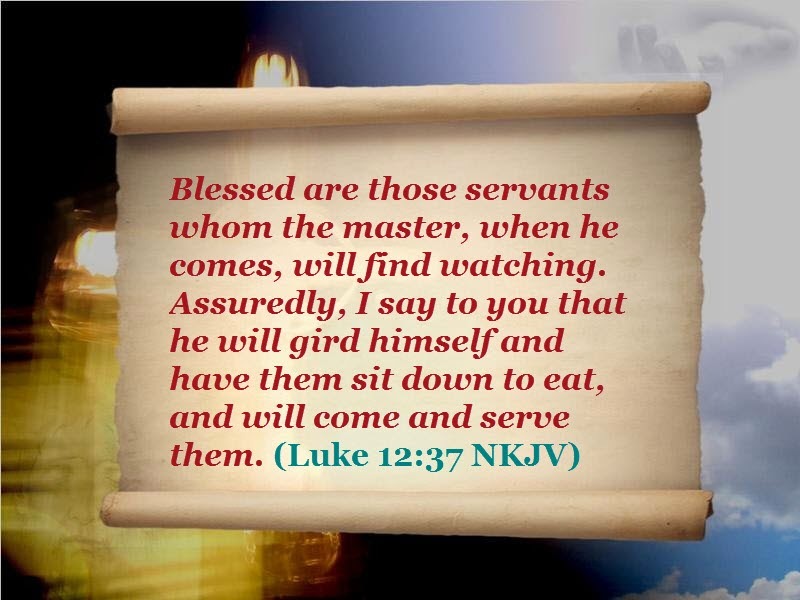 Some will be moved by the Spirit to surrender to Christ helping to complete what I refer to as "The Watchers Trinity." These three work in concert filling up their part in bringing to bear the second coming of our Lord Jesus to set up His millennial reign (Rev. 20:1-6). The full number of the gentile believers, who through His infinite foreknowledge God alone knows, the spreading of the gospel around the world and into every ethnic (ethnos) group, and the topping-off of the cup of sin this world raises before God are all nearing their ends. And to add to these, our generation is the VERY FIRST to witness global persecution for the cause of Christ. "According to the International Society for Human Rights, a secular group with members in 38 states worldwide, 80 per cent of all acts of religious discrimination in the world today are directed at Christians. Persecution is in its mature stages in the Middle East, Africa, Asia, and some European nations and the baby stages in the West; but none-the-less it is still global. 97.5% of the world's population now has the gospel in its hands. According to Wycliffe Bible translators only 180 million are in waiting for a translation in their language. That sounds like a lot but with a world population of 7.3 billion (http://www.worldometers.info/world-population/) it is really only around 2.5% that are still waiting—less than that if you consider the ethnic parentage of these remaining tribes most likely already have it. (https://www.wycliffe.org/prayer/why-pray-details/why-we-pray (Scroll to bottom)) Wycliffe's goal is to be complete in TEN YEARS!!!! Even better news for those looking for and ready for the pre-tribulation rapture is we do not need the 10 year wait! During the tribulation we are told the 144,000, two witnesses, and gospel angels will take the gospel to the remainder of the world in what I believe is a final proclamation. We must pray and do God's business ("Occupy" for all you KJV'ers) till He returns. I find comfort in prayer and the like-mindedness we have here on RF. Will things get better???? Good question. My answer is NO! Not as in a global "Great Awakening." But I do believe there must be pockets of renewal among believers meant to induce us to stand for Jesus in the face of the current and coming ridicule and persecution. Suffering for Jesus' sake always results in good for the lost. Some will be moved by the Spirit to surrender to Christ and help complete that "Fullness of the Gentiles" and the "Spreading of the Gospel" throughout the earth, both of which are harbingers of the nearness of the Second Advent of Christ. Another is the Fullness of Iniquity (the root sin in action and penalty) - (Gen. 15:16). These three together make up what I call the "Watchers Trinity"-- those things that will occur before Christ comes back (EOT) end of trib. Our Generation is the VERY FIRST to witness global persecution. It is in its mature stages in the Middle East, Africa, Asia, and some European nations and the baby stages in the West; but none-the-less its global. 97.5% of the world's population now has the gospel in its hands. According to Wycliffe Bible translators only 180 million are in waiting for a translation in their language. That sounds like a lot but with a world population of 7.3 billion (http://www.worldometers.info/world-population/) it is only around 2.5% (https://www.wycliffe.org/prayer/why-pray-details/why-we-pray (Scroll to bottom)) there goal is TEN YEARS!!!! to be complete. But we do not need the 10 years for during the tribulation the 144,000, two witnesses, and gospel angels will take it to the world in what I believe is a final proclamation. 100% of the Countries have the gospel in them. And sin is nearing its fullness globally. So will things get better, no, but pockets of renewal and revival will occur in order to reach the remaining lost. That is where our prayers need to center IMO. For the first time in history the persecution of the saints of God has gone global!! Very soon the faith of Christians and churches all over the America is going to be put to the test. Even as we speak, hatred and antagonism toward Christians is making headlines across the nation. Will you be able to stand boldly for Christ when called upon? The Sifted Generation is a resource to help believers understand the seriousness of what is confronting us. It also gives loving counsel on how to face the coming onslaught and reveals why our generation is witnessing the alarming rise of darkness. The world is choosing its sides and the stage is being set for soon return of the Lord Jesus Christ! I recently stumbled upon this site and thought I would share it. Excellent Info for those looking for the return of Christ! Those Who Are Wise Will Shine! ....Understanding the Work of God in Your Redemption. Those Who Are Wise Will Shine! FREE -25 Reasons to Believe! Fornication - The Acceptable Sin?